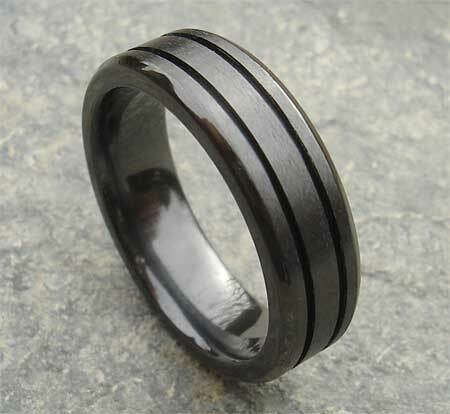 Grooved Black Wedding Ring For Men : LOVE2HAVE in the UK! 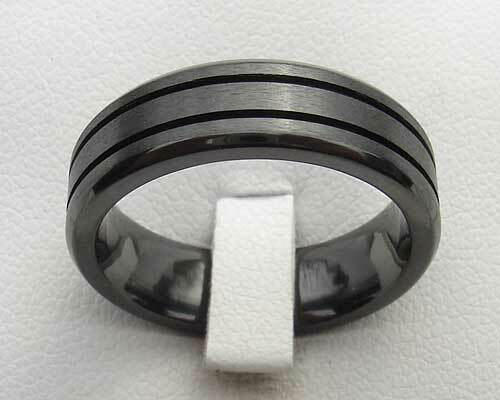 A flat profile zirconium men's wedding ring with bevelled edges, two grooves and a shaped inner for that comfort fit. This ring is available in a polished or a satin finish with polished edges. The widths available for this ring range from 5mm to 8mm, so not only is it suitable for men but women also. The treated zirconium won't scratch badly from everyday wear and tear. We would suggest not to subject it too heavy engineering equipment, though. Zirconium can be polished merely yourself to reduce any light marking, and in some cases, we have found that the surface that the ring has come into contact with has moulded into the surface of the zirconium itself. At first glance it can look like scratching but this is not the case. Zirconium is quite magical. Width(s) Available: 5mm to 8mm.